Modified Figure 1 of Hentschel et al., 2012. 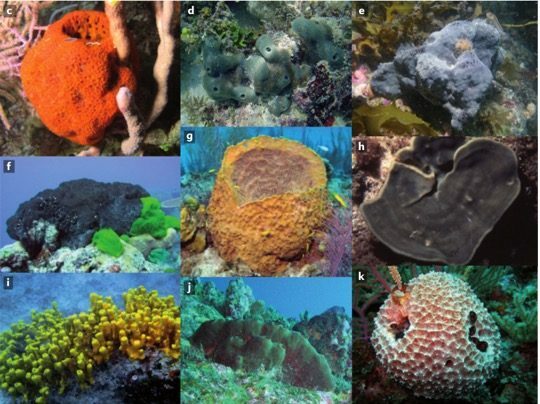 Diverse marine sponges. The ocean is full of interesting organisms and even more fascinating (as well as difficult to tease apart) are the interactions among them. From deep sea giant tube worms, to the adorable bobtail squid, symbioses have a central role, and sponges are no exception. In a recent article by Moitinho-Silva and colleagues in ISME, they used genomic sequence data to unravel the interactions between the marine sponge Cymbastela concentrica and its symbiotic microbes. To start with, sponges are pretty dang cool. It’s estimated that they originated about 600 million years ago, representing some of the most ancient of animals. They also play a variety of important roles in benthic communities and are abundant in polar regions as well as in temperate and tropical reefs. Sponges are filter-feeders and a kilogram of sponge can filter thousands of liters of seawater daily. They also harbor a vast array of microbial symbionts including bacteria, unicellular eukaryotes, and archaea. Not only do they house a diversity of microbes, there’s also a lot of them, up to 35% of the sponge can be made up of microbial cells. Modified from Figure 1 of Hentschel et al., 2012. Schematic diagram of a typical demosponge. Another reason sponges are nifty is that they are responsible for the production of a variety of biologically active compounds (a fancy way to say that they make molecules that have the ability to damage or kill something else, which could be determined in an assay for antitumor compounds, for example). The sponge isn’t the only one responsible for making interesting compounds, its microbial symbionts are also involved in many cases. 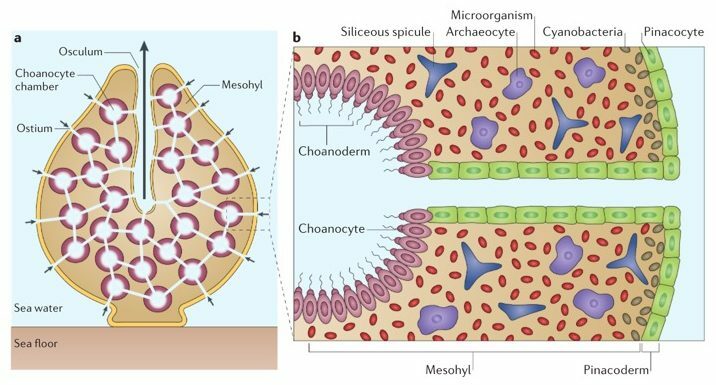 For an interesting review on this aspect of sponge biology, check out the reference I’ve included by Ute Hentschel and colleagues below. Figure 1 from Moitinho-Silva et al., 2017. Predicted model of integrated metabolic processes within Cymbastela concentrica. It has been previously established that C. concentrica has a suite of uncharacterized microbial symbionts, including a healthy population of diatoms. Other studies even used a variety of ‘omic approaches to characterize the complex community of this sponge. Moitinho-Silva et al., take things a step further and attempt to not only characterize the microbes harbored by C. concentrica, but also uncover the link among their metabolic activities. 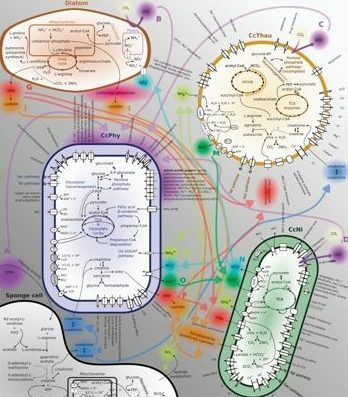 The authors reconstructed three new symbiont genomes (which they named CcPhy, CcNi, and CcThau), analyzed a set of metatranscriptomic sequences, and also took into account eukaryotic transcriptomic data from the sponge. The CcPhy genome is most closely related to the Phyllobacteriaceae, the CcNi was most similar to microbes in the phylum Nitrospirae, and finally, CcThau appeared to be similar to representatives of the phylum Thaumarchaeota, hence the naming system. Using the genome sequences, the authors painted a picture of the likely roles these symbionts have within the sponge. Figure 6 from Moitinho-Silva et al., 2017. Expressed metabolic functions in diatoms and the sponge. The transcriptomic sequences allowed the authors to figure out what the most expressed genes were in relation to different functions, like membrane transport (see Figure 2), or electron transport, nitrogen metabolism, and urea uptake (see Figure 3). 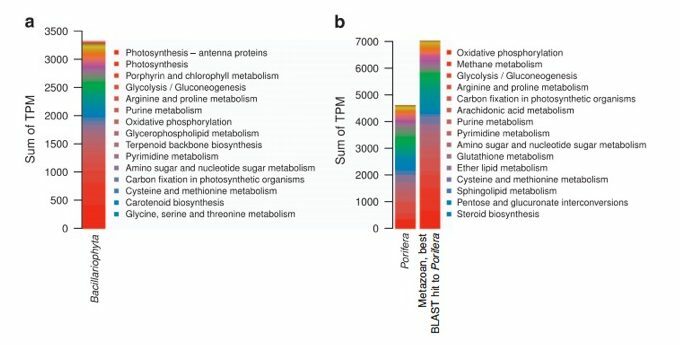 They took a look at the transcripts expressed by the symbiotic diatoms as well as the sponge and put together a summary of the overall functions expressed (Figure 6). Figure 1 from Moitinho-Silva et al., 2017. Microorganisms associated with the sponge visualized with fluorescence in situ hybridization. CcNi probes are green, while CcThau probes are magenta. 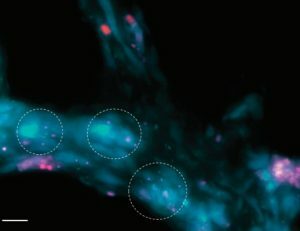 As a cool demonstration of where the newly identified symbionts can be found in the sponge, Moitinho-Silva and colleagues also used fluorescence in situ hybridization. These images emphasize that the sponges and microbes share an intimate relationship, and make it easy to believe that sponge and symbiont evolution are closely linked. 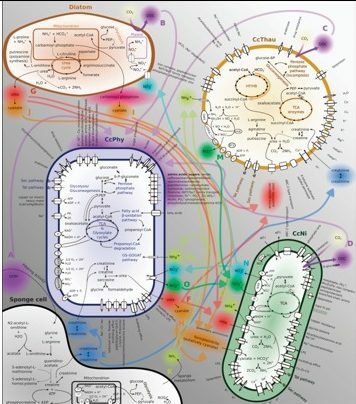 This study provides a nice window into connectivity among metabolic pathways in symbiotic relationships and emphasized the importance of looking at the entire system when attempting to unravel interactions between hosts and their important microbial partners. There are so many examples of how microbes influence the world around us, this study presents a good example of just how complex interactions are among marine organisms, and also how much we have left to learn. This entry was posted in Coevolution, community ecology, genomics, metagenomics, microbiology and tagged Cymbastela concentrica, marine sponge, symbiosis. Bookmark the permalink.